Not truly a spinach at all, malabar spinach is a leafy South Asian green with dark, succulent, heart-shaped leaves. Malabar spinach, or vine or basella spinach, grows on a creeping vine and thrives in the heat. English spinach tends to suffer in southern climes, but malabar spinach is happiest in the 90 degree sunlight. Malabar spinach leaves are thicker than English spinach- when eaten raw, the leaves have a firmer, juicier bite and taste somewhat citrusy. 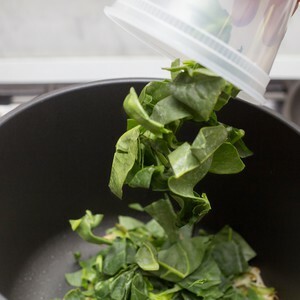 When cooked, it's quite similar to spinach, though it tends to hold up better in soups and stews, and is a great addition to stir fries. Malabar spinach is also mucilaginous (much like okra) so it's a great thickening agent. Malabar spinach can either be red-stemmed (Basella rubra) or green-stemmed (Basella alba). Malabar spinach flowers form small red-purple berries that are deeply colored and can be used in natural dyes. Like many dark, leafy greens, malabar spinach is rich in iron, Vitamin A, Vitamin C, and calcium, as well as soluble fiber.